Go Crazy Over Pizza from Cici’s! Cici’s Pizza is a unique restaurant in Branson where you will go crazy as you get to taste their tasting pizzas that were made from scratch. Located beautifully on the strip across the street from White Water, the pizza company opened its first location in Branson in early spring 2015 when it signed the franchise agreement with Fogle Enterprises Inc. This location in Branson previously housed the Plantation Restaurant and the new Cici’s Pizza was built in its place. The pizza restaurant also has another location in Springfield. The Coppel, Texas-based Cici’s Pizza has about 500 locations in 33 states. The pizza restaurant is best known for its family-friendly atmosphere and offers endless variety of pizzas on its custom buffet. This pizza restaurant in Branson also features a large game room area to complement guests with children. Nolan Fogle, owner of Fogle Enterprises says “CiCi’s is a great concept to bring to the Branson community and we found the perfect location on the Historic Highway 76 strip, just across from the White Water Branson Water Park.” With more than 20 years experience in making tasty pizza, the company is thrilled to expand the business. Nolan always dreamed of owning his own restaurant. When he was still young, he was hired as a server to work the night shift at a local restaurant. While he was eager to learn more, he would also come in during the day shift to know more about the operations of the restaurant. Now, Nolan and his wife, Babette, are respected owners of The Great American Steak and Chicken House, The Fall Creek Steak and Catfish House, The Baldknobbers Restaurant, The Burger Steak Shack, and Pasghetti’s Italian Restaurant. In addition to affordability of their pizza and its wide variety, the new CiCi’s Pizza restaurant in Branson is sure to be patronized in the area because of the brand’s commitment to community outreach. Since its inception, Fogle Enterprises have crafted a charitable culture by partnering with churches, local schools, and sports leagues. The company is proud of Nolan and Babette who are better-equipped to help the company expand the Cici’s Pizza brand into the Branson community. The entry of Cici’s Pizza restaurant into the Branson market is part of the company’s mission to grow the brand in the coming years. To help increase the growth of the brand in new and mature markets, the company has developed several financing and incentive programs to assist prospective franchises with funding options. Over the next five years, Cici’s Pizza will also explore growth potential overseas, as well as in nontraditional venues such as casinos, airports, military bases, and universities. The Texas-based company offers both single and multiunit development opportunities for those who want to enter into franchise agreement. 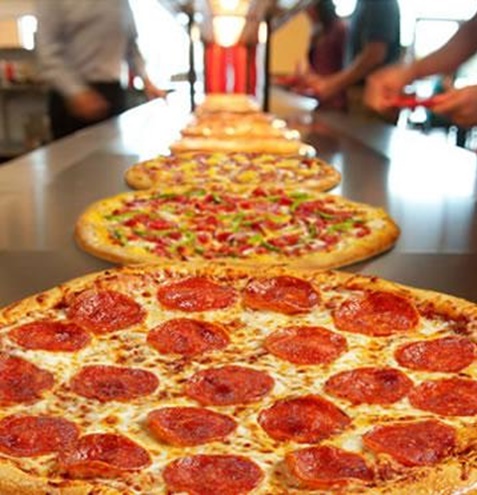 Whether you want to host a party or come for dinner, you are sure to enjoy your favorite Cici’s Pizza flavors. In this pizza restaurant in Branson, you can pick anything you like from its buffet menu and have a great time eating tasty pizza.